We are delighted to introduce you to Evlyn Gould, our High Holiday Cantor for 5778. Evlyn is a third-year cantorial student with Aleph Alliance for Jewish Renewal and was highly recommended by the dean of that school, Hazzan Jack Kessler. Cantorial School is a second career for Evlyn, one she has been pursuing for over 10 years. 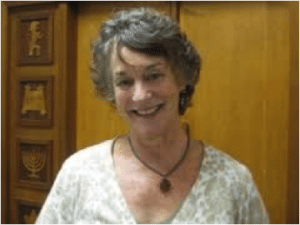 She has been a cantorial soloist and service co-leader for several years, and has been mentored by Rabbi Yitzach Husbands-Hankin, a leader in Jewish Renewal, Reb Zalman ordainee, and friend of THZ’s rabbi emeritus, Rabbi Richard Simon. Evlyn has studied with numerous teachers and is familiar with both traditional and Renewal-style services. Evlyn is currently working on a CD project, “Sounds of the Sephardim,” as part of the Ladino Music Preservation Project, as well as a study project on kabbalah and magic in 19th-century France. She is a College of Arts and Sciences Distinguished Professor in the Humanities and Professor Emerita of French Literature, Department of Romance Languages, at the University of Oregon. Evlyn has been working with both Rabbi Tiferet and Rabbi Simon to prepare for our High Holiday services. We anticipate that her lovely voice and spiritual presence will bring special meaning to this year’s services.